Home › Passenger Car Ferries › RoPax Ferry › Damen RoPax Ferry 8017 › Damen RoPax Ferry 8017 "Legionnaire"
The MV Legionnaire is sister ship to the MV Veteran. Both vessels are part of a large vessel replacement programme being undertaken by the Provincial Government. 81 Metres in length and with a beam of 17 metres, she will carry up to 200 passengers and 60 cars (PAE) at a cruising speed of 14 knots. 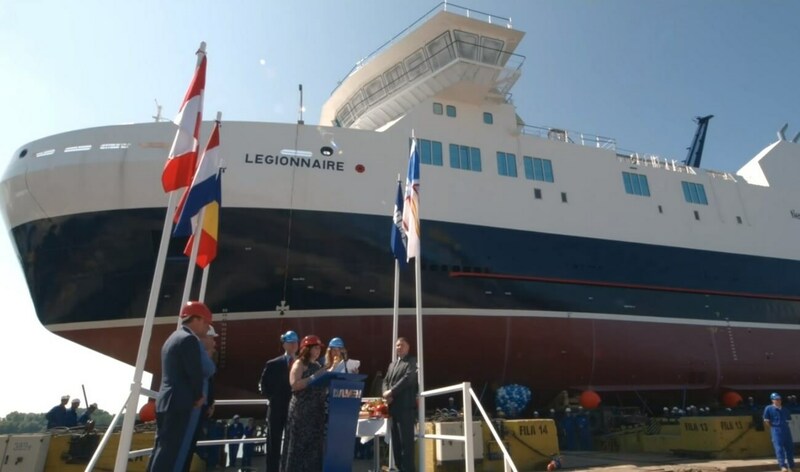 MV Legionnaire will operate on the short-haul route from Portugal Cove to Bell Island, the busiest route of the province. The vessel has been delivered to Newfoundland in the spring of 2016.